The heavyweight division has held a lot of negotiations and discussions about big fights in the past few months. The fighters included Anthony Joshua, Deontay Wilder, Tyson Fury, Dillian Whyte and Jerrell Miller. Joshua mentioned in a leaked audio phone call that he would be heading over to the United States in preparation for a fight. Though the 29-year-old didn’t mention the opponent’s name, it has since come forward that Jerrell Miller is the chosen one. “I think we’re going to have to go to the States,” Joshua says in the leaked audio. “The only thing I can think is if they’re trying to make me stop training and then two weeks later say, yeah we want to fight, and so I’m two weeks out of preparation. “Other than that, in my mind I’m going to the states,” he added. Dillian Whyte, a rival of Joshua, was in talks of a potential rematch with AJ in April but talks had fallen through. One theory of this fall-through was due to Whyte demanding more money for the bout with AJ. Allegedly, the figure amount was around £5 million. This is similar to Wilder and Fury who also refused the terms offered to them in fighting Joshua. Multiple sources including promoter Eddie Hearn have stated that a fight between AJ and Miller are close to a done deal and likely to take place in June at Madison Square Garden. Many boxing legends fought in that arena such as Jack Dempsey, Sugar Ray Robinson, Muhammad Ali, Joe Frazier, Roberto Duran, Mike Tyson and many more. He also said that Joshua facing Miller in his first US debut would be perfect for him, considering the power and aggression that the American brings to the table. ‘Dillian believes he can improve his value with another spectacular win and someone like Breazeale should give him the chance to prove it,’ Hearn added. But Miller (23-0-1) has vowed that he will not let AJ have his glory in his homeland of America and is ready to make a statement to the boxing world. Miller has also stated that the deal is not yet. He stated: “I was quiet for a little while, I had to take care of some internal stuff. We’re still having out, you know, these errors. “And like I said before, I’ve been waiting for the moment to shock the world. Confirmation of the bout is expected this week. But what styles, stats and variations does each fighter have? Joshua, who holds the WBO, WBA, IBF and IBO heavyweight titles, has a record of 22 wins with 21 by knockout and no defeats. In his last eight wins, seven were knockouts and only one KO win past the tenth round. He is currently ranked no.5 at Boxrec’s Pound for Pound ranking system and has a knockout ratio of 95%. Joshua is penetrating and powerful with his punches. They are sweet to see but sour to taste. He is a huge pay-per-view draw and has fought in big stadiums drawing crowds of 70,000, 21,000, 20,000 and even 90,000 in attendance for his fight against Wladamir Klitschko. By the numbers, Joshua keeps himself active at a rate of 40 thrown per round and landing at 14 with a connect percentage of 35%. The average heavyweight throws around 44 and connects about 33%. As a plus point, his opponents only land around 21% of their punches. 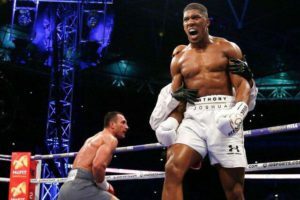 In the jab category, AJ throws at the same amount as the average heavyweight which is 20 and connects 31% of his punches while the average rate is 25%. Miller, based in Brooklyn, New York, USA, is ranked no.6 heavyweight in the world by BoxRec and no.2 in America. Based on his record, 20 of his 23 wins are by KO and his knockout ratio stands at 83%. His form of style is hunting and finishing his opponents when he can land a shot. His weight is also a big factor considering the fact that he weighs in 300 pounds plus on fight night. Fighters that are usually big in size tend to be the swarmer style kind of fighters and trade on the inside. Based on the Compubox statistics review, Miller throws around 66 punches and lands 22 of his punches. This a higher rate of activity and accurate level than Joshua. Another plus point for Miller is that he throws around 41 of his power punches and lands at 16 with a connect percentage of 40%. The attempts are almost double the amount of the average heavyweight (24 thrown). However one should be aware that Millers’ opponents have landed 38% of their power shots against him. For many boxing fans particularly those in the UK, it might not be a compatible bout to view and be excited about. Despite what the data says, Miller has never a strong 240 plus knockout artist like Joshua. A lot of people would’ve been more excited and thrilled had the opponent been Whyte, Fury or Wilder. However one cannot deny the selling point of AJ and the kind of numbers he draws. At Madison Square Garden, the home arena of boxing will be a fantastic debut for the Briton.